23 oktober 2017: Zo het gaat hard bij Tesla. Er is een officiële deal met de Chinese overheid om ook in China een gigafactory te gaan bouwen: gigafactory in Shanghai. 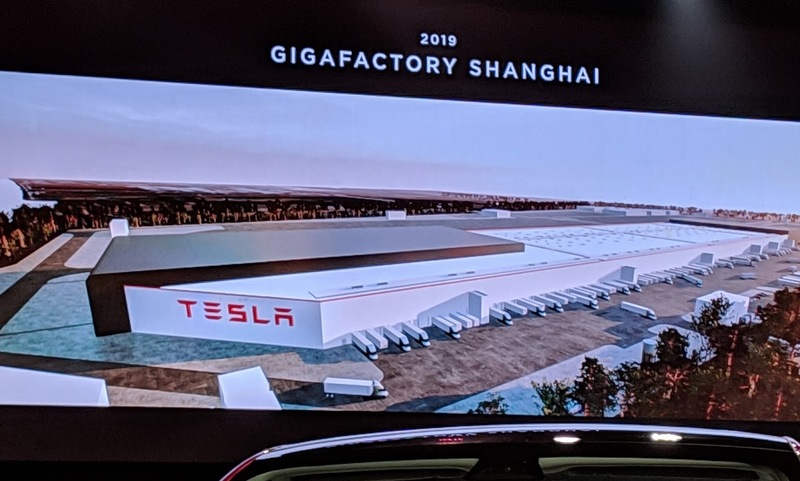 Tesla will have Gigafactory 3 groundbreaking ceremony today 7th January 2019 in Shanghai, China. Estimate time 3:00-3:00pm Shanghai time Jan 07 2019. 12 juli 2017: Zo, het is al weer tijd voor een tweede Tesla Gigafactory in Buffalo. Geen compleet nieuwe fabriek dit keer, maar een bestaande faciliteit die Tesla heeft overgenomen na de acquisitie van Solar City. In de gigafabriek in Buffalo gaat men die mooie solar dakpannen produceren die Solar City op de markt brengt. Net als bij de gigafactory 1 in Nevada gaat Panasonic helpen bij de productie. Opvallend is dat het dak van gigafactory 2 nog niet is voorzien van zonnepanelen of solar tiles. Neem aan dat dat slechts een kwestie van tijd is voor het dak helemaal vol wordt gelegd met zonnepanelen. 19 november 2015: Mooi hoor, De nieuwe Tesla gigafabriek in Nevada wordt energieneutraal en gaat via een gigantisch solar park net zoveel energie opwekken als er wordt verbruikt. De elektriciteit komt van zonnecellen op het dak en zonnecentrales in de buurt. De fabriek krijgt elektrische warmtepompen waarmee warmte en stoom wordt opgewekt. Het dak van de fabriekshal is volledig vlak ontworpen en er staan geen technische installaties of ander objecten die schaduw geven. Toch is het dak niet groot genoeg om alle benodigde elektriciteit op te wekken. Dus worden er in de omgeving van de fabriek nog wat zonneparken aangelegd op gunstig gelegen heuvels. Tesla verwacht met de onlangs aangekondigde Tesla Model 3 honderdduizenden elektrische auto’s te kunnen verkopen en daar is een grotere fabriek voor nodig, die de batterijen gaat produceren. Duurt nog wel even voor Tesla Model 3 op de markt komt. Naar verwachting leverbaar vanaf 2018. JB Straubel, co-founder and chief technical officer of Tesla Motors, shares an energizing overview of how advanced battery technologies and electric cars can pave the way toward energy independence and economic development, and how education and innovation plays a key role in reaching those goals. Tesla, Panasonic Ink Deal To Make Huge Battery Gigafactory. The deal will help build a massive battery factory that Tesla says will produce 500,000 lithium batteries by 2020. Leonardo DiCaprio visits Tesla’s Gigafactory and discusses with Elon Musk how the world can transition from fossil fuels to renewable energy. Meet the utility grid of the future: Tesla’s Powerpack installation at the Southern California Edison Mira Loma substation will reduce the LA Basin’s reliance on fossil fuels. Designed, engineered, built and deployed by Tesla, Powerpack is a scalable energy storage solution for utilities and businesses that maximizes safety and efficiency, and reduces the grid’s reliance on fossil fuel-generated electricity. Tesla has been awarded a contract to install the world’s largest lithium ion battery. Under the agreement, the company will build the system within 100 days or else it’s free—a promise CEO Elon Musk famously made in March to help solve South Australia’s energy woes. VW Group remains one of the world’s three largest carmakers, but the German automaker foresees challenges ahead. Specifically, Volkswagen believes the industry will face a shortage of lithium-ion batteries if new investment is not made soon for additional cell fabrication factories, often referred to using Tesla’s coinage of gigafactories. Ulrich Eichhorn, Volkswagen research and development chief, believes the equivalent of 40 Tesla gigafactories will be needed to stave off a shortage of batteries for the volumes of electric cars VW plans to sell by 2025. At the National Governors Association Elon Musk confirmed that 2 or 3 more Tesla Gigafactories are coming to the US within the next few years. Last month, Tesla confirmed that their shareholder meeting that they were currently working on 3 more Gigafactory locations to produce both vehicles and battery packs. While he says that Tesla will build more Gigafactories in the next few years, they are doing it before their first Gigafactory is even completed. Gigafactory 1 is expected to produce more li-ion batteries each year than the entire current world capacity – enough for over 1 million all-electric vehicles per year. Tesla has been promising announcements for those new factories by the end of the year. A new massive li-ion battery gigafactory has been announced in Germany. The new facility announced by TerraE-Holding is deserving of the name with a planned capacity of 34 GWh at full production. TerraE Holding will choose one of five candidate sites in Germany or a neighboring country next month to build its 34 gigawatt-hour battery factory. TerraE Holding has composed 17 major companies and research institutions to a consortium to handle planning for building large-scale lithium ion battery cell manufacturing in Germany. The consortium includes companies from throughout the supply chain, such as infrastructure manufacturing planners, material producers, machine engineering companies, cell manufacturers, and industrial consumers. Tesla has confirmed that the company started solar cell production at Gigafactory 2 in Buffalo. The company’s production goal has been updated to 2 GW of capacity per year. Previously, SolarCity, which started the project of the Buffalo plant with the acquisition of Silevo in 2014 before it was itself acquired by Tesla, guided for an annual production capacity of 1 GW of solar panels at the factory. It would have made it the biggest solar panel factory in the country, but they also left the door open for further expansions. Now Tesla says that they are looking at ways to improve efficiency to reach that goal after their target of 1 GW in 2019. Tesla finally confirmed working with the Shanghai government to establish a manufacturing facility in the region and promised an announcement by the end of the year. “100 days from contract signature or it’s free,” Musk tweeted at the time, in a deal initially negotiated over Twitter. Musk is well ahead of schedule (a rarity for Tesla! ), with the 100MW battery set to be energised and tested in the coming days. Tesla Powerpacks have been installed and connected at Neoen’s Hornsdale windfarm, north of Adelaide, and battery tests will be run to ensure local regulatory requirements are met before it begins operating on December 1st. Elon Musk’s SA battery record will be short-lived as rivals go even bigger – South Korea’s Hyundai Electric & Energy Systems is building a 150-megawatt lithium-ion unit, 50 per cent larger than Musk’s, that the company says will go live in about three months in Ulsan near the southeast coast. And then this plant will be passed by a larger one. And then it will happen again. I remember sometime in 2016 when I used to only retweet solar projects that were 100MW or larger – and I was amazed at the project sizes. Now, 1GW gets my attention. Soon – that’ll be with batteries too. When will we see the first 1GW announcement? 2018 maybe, 2019 definitely. Tesla Inc switched on the world’s biggest lithium ion battery on Friday in time to feed Australia’s shaky power grid for the first day of summer, meeting a promise by Elon Musk to build it in 100 days or give it free. “South Australia is now leading the world in dispatchable renewable energy,” state Premier Jay Weatherill said. Tesla and the government of South Australia have announced a stunning new project that could change how electricity is generated not only in Australia but in every country in the world. They plan to install rooftop solar system on 50,000 homes in the next 4 years and link them them together with grid storage facilities to create the largest virtual solar power plant in history. Installation for what could become the world’s largest solar rooftop has begun at Tesla’s Gigafactory 1 in Nevada. The US-based electric vehicle and solar firm announced in January plans to install 70MW of solar panels on to the rooftop of its battery cells, which it develops with Panasonic, and energy storage plant. If the firm complete their goal, the roof will be the largest solar roof installation in the world. A new video showing construction progress at Tesla’s third Gigafactory outside of Shanghai, China. Tesla is working towards standing up the new Gigafactory in record time, with a target of delivering the first Model 3s and Model Ys from the factory in 2020 (and some even speculate it could be in late 2019). What is a gigafactory? What is made in a gigafactory? You’ve heard the word, now learn exactly what is going on inside one of Tesla’s giant, mysterious gigafactories. The structures for several buildings are now coming up and the factory is starting to take shape. Completing the building is one thing, but Tesla also wants to have vehicle production there by the end of the year. Construction progress continues at breakneck speed at Tesla Gigafactory Shanghai (aka Tesla Gigafactory 3), with the latest video update from Wuwa Vision showing roofs starting to go up on several of the site’s structures. With the current construction speed, the factory will complete construction in July or August, a construction worker told the Global Times on condition of anonymity. His prediction was echoed by another worker who anticipated that the construction can wrap up in July. The official timeline remains that vehicle production from Gigafactory 3 is planned for sometime between Q4 2019 and Q1 2020. Recent official Chinese records showed a September 2019 target for completion of the main stamping, bodywork, painting, and assembly workshops.